On Sale Now! Save 9% on the Global Art Materials Hand-book Journal Co. 5-1/2-Inch by 8-1/2-Inch Quattro Journal, Grid by Global Art Materials at Designers Artists. MPN: 35533. Hurry! Limited time offer. Offer valid only while supplies last. 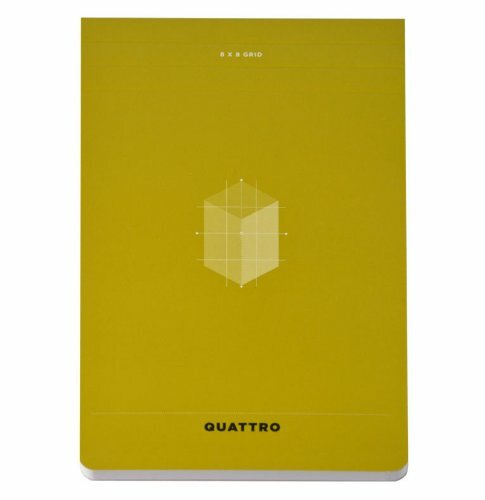 Quattro Artist Journals have rounded corners that will resist damage as you carry it. The specially laminated cover resists dirt and stains. Quattro Artist Journals have rounded corners that will resist damage as you carry it. The specially laminated cover resists dirt and stains. Substantial book board is built into the pad back making Quattro Journals sturdy for writing or drawing and comfortable in the hand. The Quattro Grid Journal 5-1/2-Inch by 8-1/2-Inch has a truly refined 1/8-Inch graph pattern with a center points as well as reference marks on the center of each edge. Each grid is printed specifically for the size of the particular journal. Sheets are micro-perforated for effortless removal. The Grid Journal has 80 sheets of super-smooth, acid-free, pure white 90 gsm paper. If you have any questions about this product by Global Art Materials, contact us by completing and submitting the form below. If you are looking for a specif part number, please include it with your message.